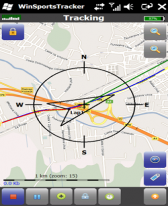 GPS2day v1.13 freeware for Windows Mobile Phone. Languages: English, Chinese, Czech, Dutch, French, German, Greek, Hungarian, Italian, Japanese, Polish, Portuguese, Romanian, Russian, Serbian, Spanish. * Translation to the Romanian was added. * Translation to the Greek was added. * Fixed some bugs, related to the minor memory leaks. * Sound alert when fix from the satellites is obtained. 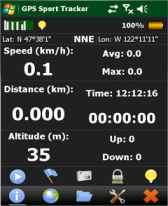 2Jack Wilson: Support for Dutch is included, see app description, and check your regional settings. why not in Dutch ? I've got it installed, was easy to install. But I don't get any satellite connections... Keeps at 0 (0) and fix says "?". What to do? 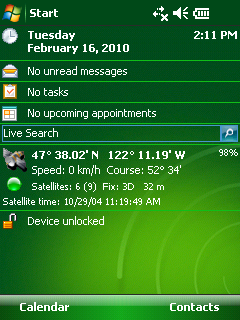 HTC Touch Pro - Start > Programs > Getting Started > Set Background > Change Image > Items Tab (bottom)> UNCHECK TouchFLO 3D > Check GPS 2day. Then it will worked GREAT! kofi is a ghanain name.lol.it means friday born.it works for me by using shellswitcher. 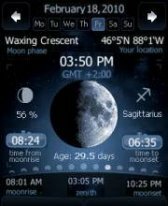 to dev: can u work on a compatibility with cookie home tab. 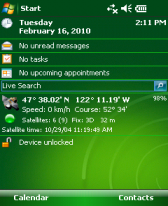 so it will be possible to ad gps2day on a sense home screen. 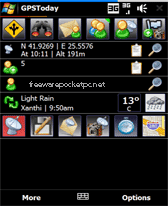 i mean on cookie u can ad the media player on home screen as its not possible originaly. 2pedro: Some of the questions already have answers on my forum. 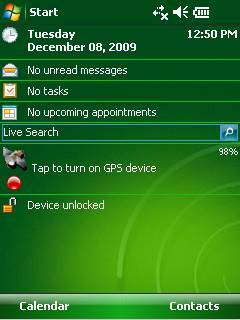 Try google search with such words "softexpanse yellow indicator gps2day"
I have a HTC Touch, but only a yellow sign is here and nothing is happening... What I can do?